With thousands of Pittsburghers are falling ill due to playoff fever, the Steelers apparently think an opportunity exists to capitalize on some of that unbridled enthusiasm with a playoff party on Friday afternoon at Stage AE. 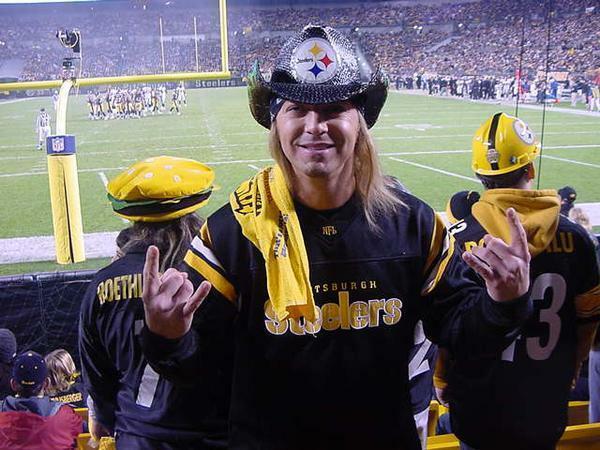 Leading the charge will be Bret Michaels, Rock of Love star, Brady Quinn buddy, and Steeler fan extraordinaire, who will take the stage at 10:00 that night. He will be preceded by performances from Tres Lads (7-8 p.m.) and Scotty Bratcher (8:30-9:30). Doors open at 3 p.m., for anyone who wants to arrive early and wait seven hours to see Bret Michaels live. Nonetheless, there will be Steelers alumni present along with Steeler highlight videos to help kill some time. The inseparable duo of Tunch and Wolf will emcee the event, which comes with a $20 price tag for admission. Tickets to the festivities are available through Ticketmaster and are available for immediate purchase. Since becoming FAN sponsored, I've noticed a serious drop in coverage of the local hockey team at Mondesi's House. Coincidence? Some big stuff is going on with the team right now and... nothing here. Absolutely not! You're hitting the nail right on the head there Koz. If anyone disagrees with that point of view, go ahead and search this pittsburgh sports site for winter classic news/recaps. Luckily we still have Pensblog, but this "Pittsburgh Sports Site" is seriously lacking in the hockey department since the fan contract. Is it just because the fan hates Mark Madden & he loves hockey? I don't get it. There is a tremendous lack of hockey coverage on here, but I must say that I felt that area was always lacking. It's not even recaps I'm looking for. I can read the game story, see highlights, or enjoy TPB if I'm looking for the satire. But I would have been interested to see MH's take on the concussion business, the recent slump, how about the Winter Classic? Sorry, a few links in the Top 20 of the Web dump don't count much for me. I respect that some people like Pitt and this is probably a great place for that--maybe better than any other blog. I don't know because I don't care about Pitt. However, I know once upon a time, there was Penguin opinion here. And I'm not even talking about the season where I contributed for a while. It's up to Don, but I stepped away because I didn't think I had anything unique to offer anymore. People with more access or more creativity were doing it better and I wasn't going to take up space just to write. If the Pens aren't going to be part of the feed here, that's fine, but just know my clicks to this site are fewer each day that goes by. I only addressed it in this forum, because I wondered if I was alone. Mike Cammalleri is out tonight. I do not like how the Pens play with a lead. They go into a third period shell where their lack of offensive aggression hinders their defensive strengths. I am amazed they have one of the best PKs in the league. I too was surprised by the lack of coverage about the Winter Classic. I was there. Perhaps I should have written something. However, given the amount of Pitt news lately I am not surprised it took priority. I do not like that the Pens haven't won a game when down in the 3rd period. The Pens were never out of a game a couple years ago. Confusing! Btw... why is everyone complaining about this site's choice's of stories in the comments section of an announcement about bret michaels? hahaha, what an asshat.